Pictured (L-R) launching the new strategic partnerships are Professor Paddy Nixon, Vice-Chancellor and President, Ulster University; Kathryn Thomson, Chief Executive at National Museums NI; William Blair, Director of Collections at National Museums NI, and Professor Ian Greer, President and Vice-Chancellor, Queen’s University Belfast. 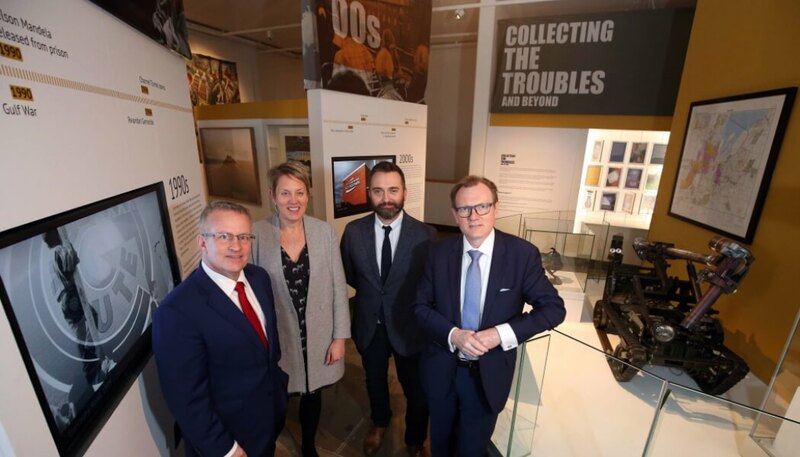 National Museums NI says the partnerships will see it ‘collaborate with departments across a broad-spectrum of research areas at Queen’s University Belfast and Ulster University’s Faculty of Arts, Humanities and Social Sciences’. This will include new agreements outlining how the universities will work together with National Museums to ensure collaboration in future research projects and ‘improved access to facilities and expertise between organisations for faculty members, students and staff’. Blair also said that collaborations such as these ‘establish a basis from which our local universities can benefit from National Museums NI resources, collections and its people’. It also allows the museums’ staff to access the skills, expertise and facilities available at Queen’s University Belfast and Ulster University to continue personal and professional development with a view to enhancing the visitor experience at the four museums. Students from Queen’s University Belfast and Ulster University will also have the opportunity to participate in and contribute to museum research and collections as well as take up placements. National Museums NI is formed of Ulster Museum, Ulster Folk Museum, Ulster Transport Museum and Ulster American Folk Park.